Vintage Delights by Adla Alhaddad: Where o' where have I been? I woke up this morning and told myself I should spare some minutes and blog the happenings of the past month or I’ll never get to it. I know it’s been that long since I last blogged. I miss clicking away on the keyboard and sharing my thoughts on screen, Blogging is actually helpful as in way it acts like a checklist of what I’ve done and accomplished and a reminder of what else needs doing. Many of you girls know that I moved into our new place a few months back, moving plus getting organized plus minor renovations here and there is something I do not recommend to anyone Pregnant!!! Instead of narrowing my focus on the pregnancy and baby projects alone , I have all of these wild ideas for the house too. But enough about what I recommend or don’t recommend, Decorating for a new house is just too much fun. I have been inspired by a lot of black lately after having changed the ugliest venetian blinds to black timber ones. Had no intention of choosing black as my choice of window covering but I was pretty happy to find the timber blinds in black coz they are not the usual suspect. Timber blinds usually come in shades of browns or white but very hardly black. So so happy with my buy and it must be some sort of coincidence that a lot of the French decor shops here are playing with black and white this season. I am looking for a louise chair that I can upholster for the family room. Yet to do my rounds in search of the perfect chair. I am slowly putting together and accessorizing my new “ blaque “ room. My new best friend is a can of Wattyl Jet black acrylic paint which has had me paint my mantle console, mirror and desk thus far...totally in love with black at the moment and am glad that I haven’t had any hiccups with this choice of risky colour. I will definitely upload pictures of the befores and afters soon. Till my next addition, who knows when that will be at the rate I'm going, I have to say Thank You for all the warm thoughts and lovely girl to girl advice many of you have shared with me through email, really appreciate it. Aaah that tree and that little bird look soooo cute!! Then nursery has turned out so beautiful, my compliments! I guess no one wonders where you have been Adla! Of course in your house and preparing for the babies' arrival. Exciting! Just let it flow! Have a nice day! I'm so excited for you. Mo tlong now until your little man is here. The nursery looks beautiful - as I knew it would. Your mum must be arriving soon, if not already, so I bet that will keep you busy. Time for you to rest up now. Of course you're feeling a little scared about everything! Sorry no going back now - sounds like you are very well prepared, your baby is a lucky little man! Oh...any days now, you must be excited!!! Adla love, our wedding anniversary is the 15th of October, hope your sweet little one comes on that date! Don't worry, as I've told you time and time again, it's a short term memory loss you'll have of the day in question all but that first look at your new love! 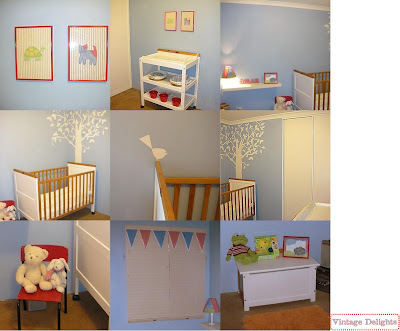 Your nursery looks sóóó sweet!!! I almost long for those days!!! I've 2 boys and a girl now and the white-clothes-days are long, long gone! Even with a girl! And I think every pregnant girl has strange habbits, nesting is one of them! Very recognizable! Enjoy your last month! LOVE the little bird and tree. What a delightful nursery. Wow, 8-months? You're almost there-Congrats! HI Adla, now I am sure your sweet little one has arrived. Don't forget to post a photo to show us your best creation ever!! Just one word? Or maybe three? We are all waiting to hear "Baby has arrived"
And your baby is going to have the sweetest little landing spot! Oh that tree! PS Looking forward to seeing black. It's a glamorous punctuation color for sure! What an adorable nursery! I'm glad you paint color worked out, it is so cute. Adla Darlin' just checking in to see if the sweet one has arrived! Just caught wind of a Pickfair estate auction taking place Nov. 22-23, 1 pE/12pC. There are some really cool items up for bid like Mary Pickford’s personal autograph book, select pieces of Pickford’s jewelry collection and rare pieces of art from Pickfair. Just thought I’d pass the info. along for all of you Mary Pickford lovers. I guess it will be broadcast live on www.auctionnetwork.com/pickfair, along with a tool that lets internet viewers to bid remotely against the floor. Congratulations! The worst is behind you and now begins real LIFE! Take the time to enjoy it all.